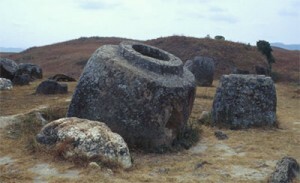 The Plain of Jars is a group of historic cultural sites in Laos containing thousands of stone-like jars, ranging from three feet to 10 feet in height, which lie scattered throughout the Xieng Khouang plain in the Laotian Highlands at the northern end of the Annamese Cordillera, the principal mountain range of Indo-China. It lies at the center of the former Hmong kingdom, which was conquered by the Vietnamese in 1832. The jars, which can weigh up to six tons and are carved from giant pieces of imported sedimentary rock, are believed to have been used 1500 to 2000 years ago, by an ancient South Asian people whose culture is now totally unknown, for purposes largely still unknown. The jars lay in at least clusters the largest of which, known as Site 1, contains over 250 jars of varying size. Initially discovered by a French archaeologist, Madeleine Colani of the Ecole Francaise d’Extreme Orient in the 1930s, the jars now lie amidst thousands of bombs left behind by America’s Secret War in Laos in the 1960s. The large quantity of UXO in the area means that only Sites 1, 2 and 3 are open to visitors – the others are considered too dangerous. The Laotian caretakers of the Plain of Jars are currently applying for status as a UNESCO World Heritage site. Clearing of the UXO hazard will be necessary before many of the sites can be studied. Though the beads, bronzes and other artifacts that Colani discovered, which led her to believe that the jars were funerary urns, have all since been dispersed, her archaeological reports remain. More jar fields have been found southward all the way to Northern India. The jars appear to be laid in a linear path that was most likely a trade route.